Have You Heard of these Underrated Horror Films? July may be a strange time of year to discuss low-budget horror films, especially when the summer blockbusters (none of which are horror films) are currently on our viewing radar. The summer months however, were always tailormade for horror treasure hunts in the video stores for my friends and I. You do remember video stores don’t you? We’d come from an afternoon at the beach with our girlfriends, straight to the video store and make a bee line home with some horrible movie such as The Evil Laughstarring one of Scott Baio’s older brothers. But not all of our impulsive rentals were disappointing. Some were in fact downright unwatchable, but many were undiscovered gems for us, especially in the days of Nightmare on Elm Street Part 36 and Jason vs. Godzilla. Wasn’t there a Chucky goes to South Central Los Angeles at one point too? Most of my favorite films have never spawned a sequel, hardly ever had stars with marquee value and sadly, never see the light of day on cable television. I’ll continue to argue up and down with someone when they tell me that the horror films of the 70s and 80s just don’t hold up to the films of today. When you talk to me about the benefits of CGI and gore over minimal production and stellar storytelling, I’m going with minimal production and stellar storytelling any day of the week. Which is why I am inspired to write this list. These films are by no means obscure although many have been forgotten about for some time and should be viewed and appreciated once again. If the new-school horror filmmakers grew up on these films, perhaps new horror films would actually be scary again. 1. 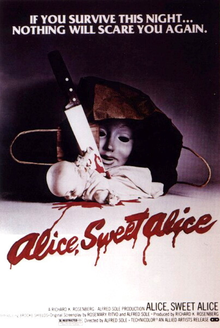 Alice Sweet Alice (1976) – This is the film that made me petrified of the translucent grinning mask. Set in Paterson, NJ during the early 60s, 9-year-old Karen (played by Brook Shields) gets strangled to death at her First Communion. Her jealous older sister Alice is of course at the center of suspicion although the actual killer is the last one you’d expect. This film was rather unique for its time as you hardly ever saw young children being murdered on-screen. With the exception of John Carpenter’s Assault on Precinct 13 that same year, I can’t really remember many films that crossed that Hollywood taboo. This film was actually theatrically released three separate times under three different titles due to Brook Shields’ ever-growing popularity after this film was made. Communion in 1976, Alice, Sweet Alice in 1978 and Holy Terror in 1981. Alice, Sweet Alice has remained the official title since then. If you haven’t seen this classic 70s flick, check it out. It has everything, a bitchy jealous sister, a fat creepy landlord and of course the horror movie’s best friend, the Catholic Church. How can you go wrong? 2. Patrick (1978) – This creepy Australian horror flick freaked me out for months after first seeing this. Patrick, who murdered his mother and her lover in the bathtub by way of electrocution, falls into a coma and his only way of communication is by electronic typewriter via psychokinetic powers. Although he is completely written off as nothing more than a catatonic vegetable, he can still murder anyone who crosses him. The thought of Patrick lying still in that hospital bed with his eyes wide open is still enough to keep me awake tonight. 3. 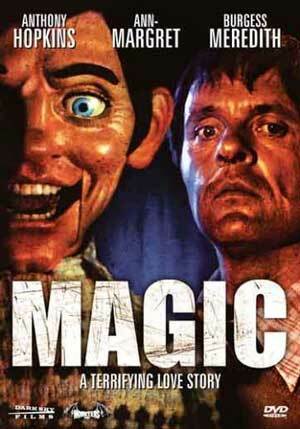 Magic (1978) – A movie about a man and his dummy. Ventriloquist Corky and his foul-mouth dummy Fats are on the road to stardom but when Corky feels the pressure of showbiz, he retreats to the secluded Catskills where he reunites with his high school crush. Fats however does not enjoy competing for Corky’s attention and soon talks Corky into “getting rid” of the people in his life that could potentially separate them from each other. The dummy, Fats, is just unsettling in every way. This was another film that made it impossible to sleep with the lights off after viewing it for the first time. 4. He Knows You’re Alone (1980) – Let me preface this by saying that this was by no means a great film, but rather an enjoyable viewing with enough suspense and cliché scares to make it worth your while. Basically it’s Halloween (1978) set in Staten Island, NY but the killer doesn’t wear a mask and the storyline is nowhere nearly as incredible. The victims aren’t babysitters, they are brides-to-be and it features the debut appearance of a young Tom Hanks. But hey, don’t let that stop you! I will say this though; there are two things about this movie that fascinate me to this day. One, the fact that Tom Hanks is in this movie actually doesn’t ruin it for me. It’s not like I watch it and say to myself “Run Forest, Run!” as the killer approaches. Two, this movie has a made-for-TV sort of vibe to it until the last fifteen minutes where one of the female characters takes a shower and shows her goodies, thus reminding me that I am indeed watching a typical 80s horror flick. 5. Are You In The House Alone? (1978) – For a made-for-television horror film, this one wasn’t bad. A suspenseful thriller about a teenage girl who’s been receiving anonymous letters that say I’m watching you and of course phone calls where a sinister voice on the other end asks are you in the house alone? Of course she is which adds to the suspense factor and naturally any teenage girl watching this film would have been scared out of their wits back then. Unfortunately it just doesn’t hold up in today’s caller ID world so anyone under the age of 30 probably wouldn’t appreciate this as much. I would like to point out that after watching this again recently, I’ve come to realize that Dennis Quaid, who plays one of the classmates in the film, is just a strange looking dude. There’s just something not right about that guy. The other thing is Blythe Danner (Gwyneth Paltrow’s real-life mother) who plays the protagonists mother in the film, is at that point younger than Gwyneth Paltrow is today. Much better looking too if you ask me, but that’s just how my mind works when I’m watching movies. Sorry. 6. Stranger in the House (1978) – Another made-for-television gem starring Linda Blair and Lee Purcell and directed by Wes Craven. A pretty simple plot where Rachel (Blair) and her family invite Rachel’s cousin Julia (Purcell) to come live with them as Julia’s family died tragically in a car wreck. Things seem fine at first until Julia becomes jealous of Rachel, then of course strange things begin to occur in Rachel’s world. If you don’t mind simple storytelling and a rather predictable plot then you’ll probably enjoy this lost classic. Hey, it was directed by Wes Craven after all. 7. 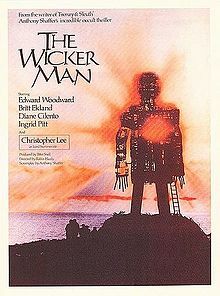 The Wicker Man (1973) – By no means do I assume that I’m exposing you to films you’ve never seen before and The Wicker Man is certainly no exception. If you’ve seen this film, you absolutely know how incredible this is. Not to be confused with the horrendously bad Nicolas Cage remake, this original version blended horror, mystery, Christianity and Paganism into one dark psychedelic musical. Filmed in Scotland, a police officer from the mainland flies out to a mysterious isolated island inhabited by bizarre followers of Celtic Paganism. He’s in search of a reportedly missing young girl but he soon discovers the girl in question might not exist, prompting him to investigate just how bizarre the island’s inhabitants really are. This film is more of a psychological thriller with a lot of psychedelic influence. The cinematography is flawless as the isolated island is as much a character in the film as the actors. Speaking of actors, did I mention that Christopher Lee plays the antagonist? Enough said. 8. The Hearse (1980) – This haunted house film dangerously teeters on the “it’s as cliché as you can get” category, however, if possessed house stories tickle your fancy then you could probably do a lot worse than this. In this film, Jane, a middle-aged woman inherits a house in the county from her deceased aunt who was believed to have practiced witchcraft. Baring a striking resemblance to her aunt, Jane is looked down upon in her new community and must contend with several strange occurrences in her new home (doors slamming shut, music boxes playing on their own.) The worse occurrence is that Jane gets followed by a ghostly hearse at night on the road home. The very hearse that is believed to have carried her witchcraft practicing aunt straight into Hell. For a film, that is over 30 years old, this one still has a chill factor to it, provided you’ve never seen it before. 9. The Strangers (2008) – I know I’ve pronounced the contemporary horror movie genre dead and I’ll still stand by that, however, every once in a while something comes along that reminds me why I started watching horror films in the first place. Suspense and tension. The Strangers had plenty of those two elements. The only caveat to this film is that it’s a one-time viewing experience to gain its full shock value. After that, the scares are watered down because you know exactly what’s happening. But upon viewing this film for the first time, you’d agree with me that this is one suspenseful ride. In short, a young couple arrives at their summer home in the country very late at night. They get a strange late-night knock on the door from a girl looking for someone who doesn’t live there. She is turned away and the guy decides to take a ride to the store to run an errand for his girlfriend. While alone, the mysterious girl knocks on the door again asking for the same person. She gets turned away again but it’s revealed (to the viewers) that masked strangers have entered the home unbeknownst to the girlfriend. Even though this movie has a few moments where you ask “why would you run that way when you should go that way?” it’s loaded with suspenseful unpredictable moments that keep you on the edge of your seat. It starts off very slow-paced but it definitely builds tension leading up to the action. Remember, this film only has shock value the first time you watch it, so turn the cellphones off and don’t allow yourself to be distracted. 10. 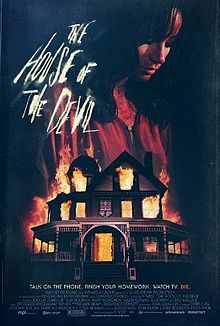 The House of the Devil (2009) – I have to hand it to director Ti West. He managed to make a horror movie look as though it was filmed in the late 70s and early 80s. Employing many elements of that era West created a gritty, suspenseful film about a female college student babysitting in a creepy old house for evasive homeowners. It falls on the evening of the lunar eclipse and the mysterious homeowners have something other than dinner and a movie on their agenda for the night. This is definitely worth watching if you’ve never seen it. The retro stylized filmmaking approach alone will make you reminisce over the scary movies we all watched on our couches back in the heyday of horror.